Blue fish in VBHH are my latest addition to the Village. Only they are not Blue Fish, they are in fact droplets of water spewing forth from the fountain. Only I have not figured out how to rotate them based on their vertical velocity only. 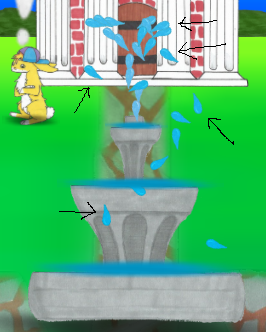 They just rotate away as they spew from the fountain. This looks bad in my opinion, well not bad perhaps, more like, what the heck is going on there! After all it makes the droplets look like fish jumping out of the fountain. Hopefully I can figure out how to make the droplets face their velocity vector, though I cannot see that functionality in the Particle stuff in Unity. I have an Enum that controls the UID (Uniuque Identifier) of each of my objects or items within my game. Originally I had them sorted, so tools were followed by consumable items and then seeds etc. However this was causing me issues within Unity, or it was when I wanted to add a new Tool. 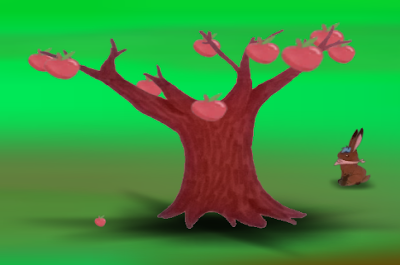 The reason is that all the Items in my Scene have a UID on them and I set this from within the inspector, using this technique it is very easy to swap what an object it, or set it when I add new artwork into the game etc. The image above shows me having set the Item_Type UID to be a World item, wooden log. The problem I am facing is when I add a NEW UID into the Enum table it bumps all the values below it down by one (obviously I guess). However Unity does not see me do this as it is in code, so the Unity inspector shows me the wrong values. My wooden log would become a Tree as it happens as that is the previous UID in the Enum list. This makes adding in new Items a real pain. So I wrote a remap table to handle this, without explaining this too much, I have to say my implementation was a failure. Which annoyed me as it took time to get al the code correct to use a remap type table, gah! Cannot always get it right of course. So what do I do now ? I changed my code and got rid of the Remap table all together. Then I made the code more intelligent as to what UID goes where. This means I trawl through all the Items sorting them when the game runs. This is now in and working and oh boy it seems cleaner. It was more coding, and a bit more runtime work (initially anyway), but then I think this should work now and be future proof. Hopefully I can add anything I want to the end of the Enum and it won't effect any other item within the list. This certainly solves my Inspector issue. I wanted to talk about what could be the most important single piece of artwork in the whole game. It is everywhere, but Not truly noticeable anywhere, it is not a tree for example, which stands proud and tall on the landscape. I call it a BLOB. I actually have a few blobs and they vary slightly in shape. The next image is my main Blob, that I have used in every scene so far in many a wondrous way. The Blob. An Alpha'd image fading towards its edges. As I have said I have placed this texture everywhere in my game, and following you will some of the uses I have put this texture to. In the above image you can see me stretching and darkening this texture to create a darkened forested look to the edge of my level. As shadows this texture has superb properties. The image above shows how I have used the Blob to alter the Skys blue hue, and also of course add a lot of difference and depth to the plains. As you can see the ground looks a lot more interesting with these brown and muddier hues. 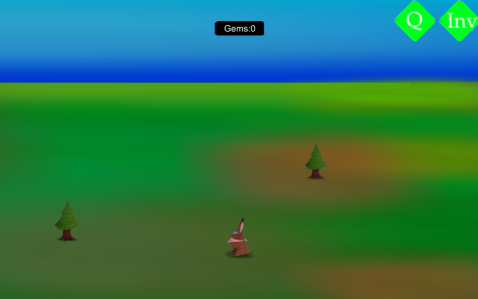 I have also used the Blobs to show Moonlight on one scene and the Hazy sunlight on another. Such a simple texture, but such a wonderfully useful texture. Have fun with your game, you might now want to use such a lovely image. I have been busy this weekend on and off. 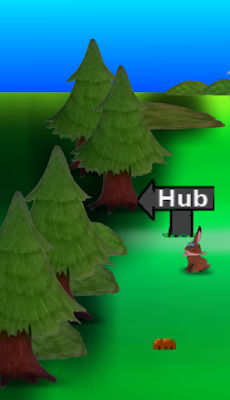 Working on Very Bunny HaHa in Unity. I now have a what I am calling an InfoBar, which pops up some minor information at the bottom of the screen. This was actually fun to do, and it is truly nice to get some minor feedback on actions you take within the game. So now when you pick stuff up it will inform you. Great addition! The second thing I have been working on is particle effects once more, odd to revisit this after a few months etc. Still this went much more smoothly this time. I now have an effect that happens when you Mine a Rock. Then at the end of the progress bar there pops up the InfoBar telling you what you mined. Lastly I created the Apple tree. This is a very important Item in this game, and I placed this special tree in the plains. It looks as good as I imagined it, which is nice. Here I am next to the lonesome Apple tree. What kind of Game is VBHH? I think it is time to start leaking information on my latest creation, even if it is several months from release. This is a work of enjoyment and love for me. I get to work with my daughter and also create a game in a genre/style that we both adore. There just doesn't seem to be a game on my PC that is Harvest Moon or Animal Crossing like. I also wanted to add the 2D platforming from Poptropica (a game my daughter loves). As I am now rolling out information I will keep adding more and more and starting development notes and commentary on the game development. Posted by VoodooChief at 11:40 AM 0 comments What kind of Game is VBHH?